Holiday time for a lot of companies means parties. Keep your behavior under control and your tongue in check by using this useful tool. The WIRED Store marks its 10th anniversary this year by including the BACtrack Vio in its list of hand picked holiday gifts. Can My Car Tell Me If I'm Drunk? The Car Doctor on Boston.com answers a simple question: is there an invention that would allow a car to tell if its driver were drunk? Oh yes, by george, there is. Popular Science this month features the BACtrack Vio Smartphone Breathalyzer in their Obsessed column, along with a few other cool tech devices they are currently lusting for. 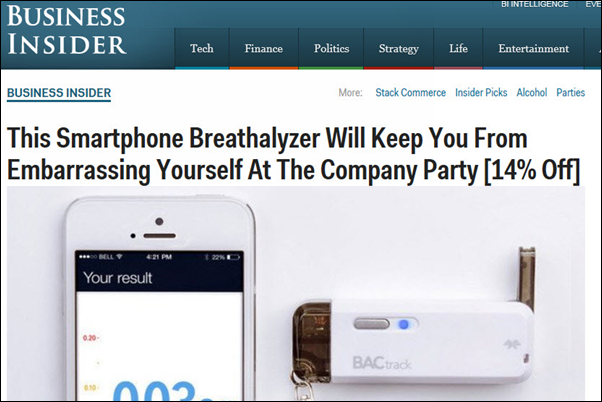 Can keychain breathalyzers positively affect people's drinking behaviors? NPR speaks with BACtrack President Keith Nothacker to investigate. CNET reported on BACtrack Mobile's win at the Good Design Awards last week. The Good Design Awards track the best design and innovation across a range of fields. For many Americans, Cinco de Mayo means celebrating with adult beverages. Using this trendy gadget will not only make your holiday spicer, but safer, too. Car and Driver held a breathalyzer showdown in their April, 2014 issue, judging a spectrum of devices from different manufacturers according to their design, performance, accuracy, and ease of use. The winner was a shocker. BACtrack Mobile earned an impressive score on UK-based tech review site RoundReviews recently. Here's why the reviewer thinks BACtrack Mobile can go to 11 for the individual. The BACtrack S35 made a guest appearance on the VH1 Classic's "That Metal Show" last week. The episode was filming a party at the Hard Rock Cafe in NYC.